Hinduism is the only religion in the world which has a holistic approach as characterized by the treatment of the whole person, taking into account mental and social factors, rather than just the physical aspect. Hinduism is the oldest religion as seen in Wikipedia on History of Hinduism. Much research has been done to find out the origin of Hinduism. The followers of Hinduism believe that their religion exists since time immemorial. Several books like BhagvadGita and scriptures like Vedas are reported to have been handed down by God himself. Still, the historians are of the belief that Hindu religion is as new as 5000 years. 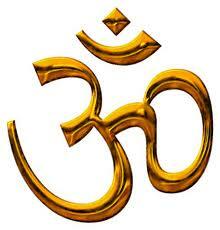 The above symbol represnts a word in Sanskrit, pronounced as"AUM" meaning the Almighty God. This word AUM is the composite of three independent letters A, U, and M, which in turn represent the Sanskrit words 'Adimatva', 'Utkarsha', and 'Miti' meaning "Beginning", "Progress" and "Dissolution or Limit" respectively. In short, AUM indicates the Powers for Creation, Development, and Destruction. Thus, the word GOD can be called as the acronym for Generation, Operation and Destruction which corresponds to the AUM of Hindu religion. The rich culture, values, and ethics of India are actually embedded in the Hinduism. They are passed on through generations. This is the strength of Secularism of India. Hinduism or Hindu religion has been appreciated for its Tolerance and Freedom of Thinking by many leaders and personalities. A few quotes of renowned personalities about Hinduism are given here. Henry David Thoreau “In the morning I bathe my intellect in the stupendous and cosmogonal philosophy of the BhagvadGita, in comparison with which our modern world and its literature seems puny and trivial. tmohan03. Awesome Inc. theme. Powered by Blogger.